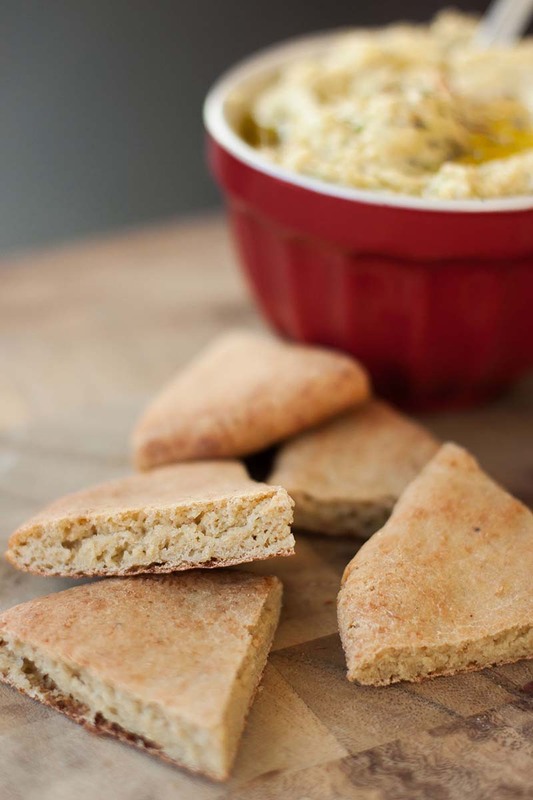 It’s easy to go gluten-free with this flatbread recipe. Enjoy them for pizza, sandwiches, dipping, and more! Begin by combining the millet flour, tapioca starch, garbanzo and fava flour, brown rice flour, and amaranth flour in the bowl of a stand mixer. Add the psyllium husks, yeast, and salt. Using the paddle/beater attachment on the mixer, mix slowly for a minute or two, until the flours are well combined. Add the eggs, and continue to beat the mixture until the eggs are incorporated into the flours. Add the olive oil and mix again until evenly incorporated. The mixture will be a bit crumbly, and it will resemble wet sand. While mixing on a slow speed, gradually add the water, starting with about 1½ cups. You want the dough/batter to be somewhere between a thick pancake batter and a cookie dough. It will not form a smooth ball as it would when working with gluten flours. If the mixture is sticky and sticks to the beater when the mixer is stopped (think cookie dough), continue to add a bit more water. You want the batter to gently fall from the beater when the mixer is stopped. Transfer the batter/dough to a lightly greased bowl, cover with plastic wrap, and refrigerate overnight. The dough will thicken overnight and rise slightly. Leave the bowl covered, and set it out on the counter so that it can come to room temperature for about an hour or so. It will continue to rise a bit as it warms up, but it will not rise as much as a traditional bread dough will. When you are ready to shape the dough, line baking sheets with parchment paper (or a silicone mat). If you have a baking stone in your oven, just bake on parchment paper directly on the stone. Measure out about 150g of dough for each flatbread and gently shape it into a ball. For more of an oval pizza, measure out about 300 - 350g of dough. Sprinkle each ball with some gluten-free flour (such as rice flour) and gently use your hands to flatten and shape the flatbreads or pizzas on the parchment paper. The dough might be a bit sticky, but should be easy to work with, especially if you dust your hands with flour. Cover the shaped flatbreads with a damp towel, and let them rise for about 45 - 60 minutes. Meanwhile, preheat the oven. For softer flatbreads, preheat to 450°F. Bake the flatbreads for 10 - 12 minutes, until golden on top. For pizza, preheat to 500°F. Pre-bake the pizza for about 10 minutes. Then, add toppings, and bake for an additional 6-8 minutes, until the toppings are warm and the cheese is bubbly and golden. Recipe created by My Kitchen Addiction. The flatbreads are definitely best enjoyed the day that you bake them. If you do have leftovers, try cutting the leftover flatbreads into wedges, brushing them with olive oil, and then sprinkling them with your favorite seasonings. Toast up the wedges in the oven for a few minutes and use them to dip away! I am soooooooo excited to see all of these GF recipes. Thank you so much! I can hardly wait to make this bread.